CROATIA E(N)Den ON EARTH / HRVATSKA (K)RAJ NA ZEMLJI from Restart on Vimeo. In July 2004. Law on Asylum was applied in Croatia. In next 2 years 300 people asked for an asylum in our country but nobody got it until November 2006. Answer why is in this documentary. While we were discovering why Croatian institutions are not ready to cope with integration of immigrants in our society, we followed campaign of Centre for peace studies. 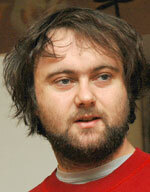 Oliver Sertić is a media activist, a producer and a journalist from Zagreb. He has published and created for the press, web and radio television. The founder of the RESTART media centre which deals with production, education, exhibition and the distribution of socially engaged creative documentaries. From 2009. he is programming director of the only documentary cinema in the region - Dokukino. He directed and produced several short and feature documentaries. Currently producing three feature documentaries in different phases of production. Has cooperated and continues to cooperate with many film festivals such as Zagreb Film Festival, ZagrebDox, Vukovar Film Festival, Dokufest, DORF... as a PR, producer and advizor. He is the director and selector of Liburnia Film Festival, programmer of the Supetar Super Film Festival, also, the associate programmer of the documentary program for the Zagreb Film Festival and Human Rights Film festival. He is the co-founder of the Amateur Film Review – RAF, the Autonomous cultural centre – Attack! and the Cross-radio project.